Birding Is Fun! 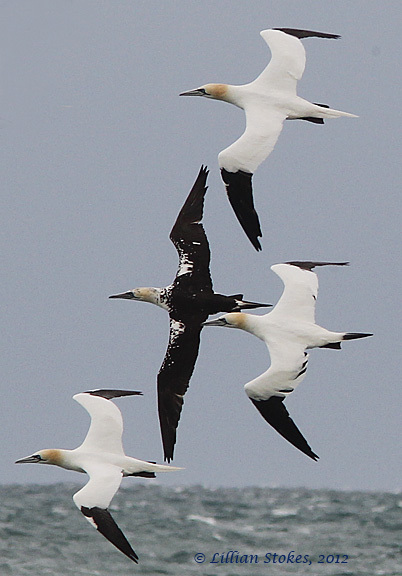 : Northern Gannet Spectacular Show! 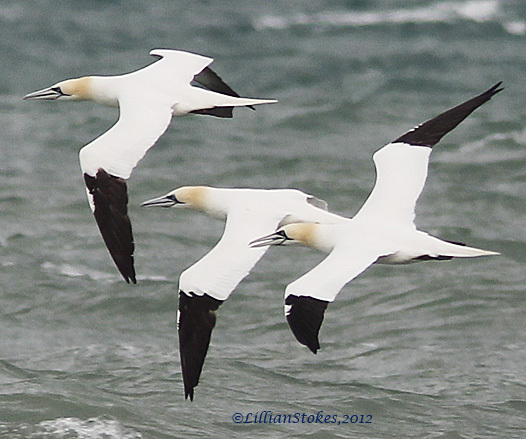 Spectacular Northern Gannets were flying by in large numbers. It can take 4-5 years for them to reach their white adult plumage. Younger birds have dark on their bodies. We moved over to the breakwater on Captiva, just north of Sanibel because they were closest to shore there. Such a dramatic bird, this one is almost an adult. They were stacked up but did not touch. They went up above the horizon then roller-coastered down low to the waves. 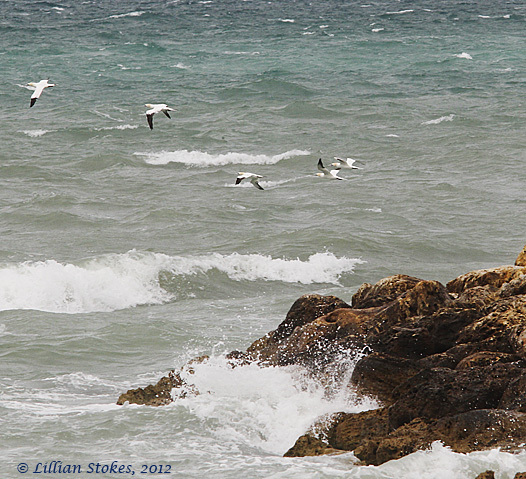 On Sanibel Island, Florida, recently we saw Northern Gannets feeding off the shore. 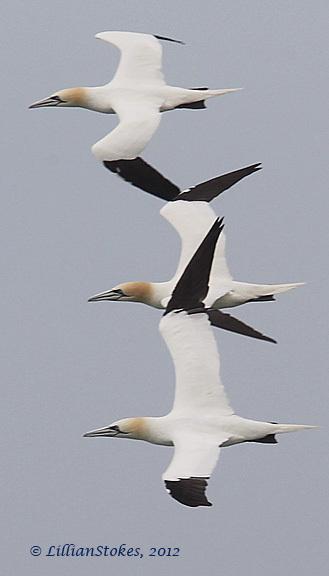 It reminded us of another time, several years ago in March, when we saw Northern Gannets migrating past Sanibel and Captiva Islands at the rate of about 900 per hour!! 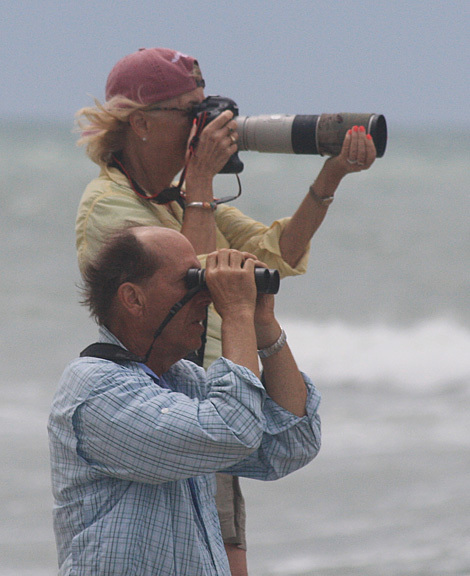 We went with our visiting NH birding friends, Meade and Sandy, to the beach at Blind Pass, Sanibel, and could not believe the numbers. Strong storms had come through and there was a WNW wind blowing hard, pushing these birds, who normally are out farther in the Gulf of Mexico, closer to shore. The birds were heading south and will eventually go around the Florida peninsula and up the Atlantic Coast to their colonial breeding grounds in the North Atlantic off the coast of Newfoundland and in the Gulf of St. Lawrence. 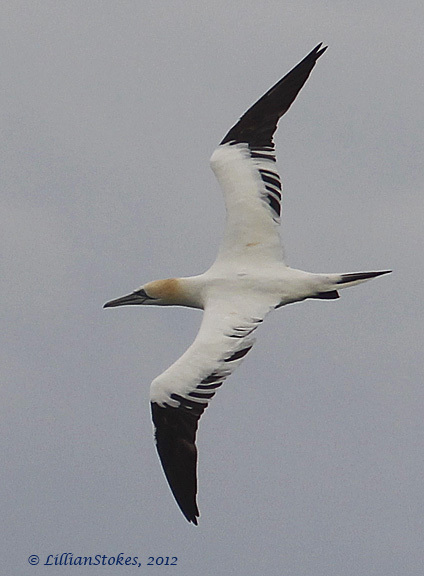 These birds are incredible flyers and spend most of their life at sea. 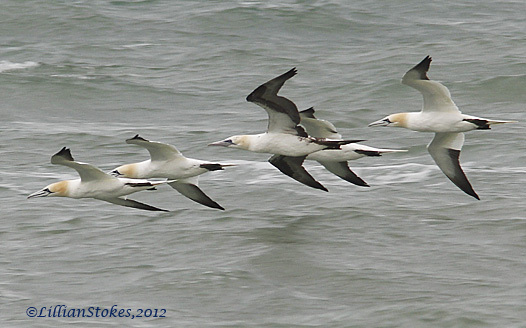 They fly in lines, undulating up and then down, skimming along in the wave troughs. The eat fish and can plunge dive as deep as 72 feet. We had a fabulous time watching them. Thank you so much for your comment, kefarley. Looks like an amazing time.....and a place to visit down the road. The pics are beautiful. Beautiful shots. How do you take such sharp shots as these lens are really heavy and the camera shakes? I use a Canon 1D Mark IV camera and 300 mm lens plus 1.4 teleconverter and there is image stabilization, I am steady, but there was high wind and it was challenging. Nice close ups of these guys. They are still on my list to get. Your first and last photo are super cool. I'm jealous that you guys can go birding without parkas, hats, and gloves. Brilliant pictures of stunning aerobatics ! Truly a sight to behold! Fantastic formations. Superb photographs of these very cool birds!